To simply say that the White Cliffs of Dover are made of chalk would miss the point of Life at the Edge of Sight: A Photographic Exploration of the Microbial World. 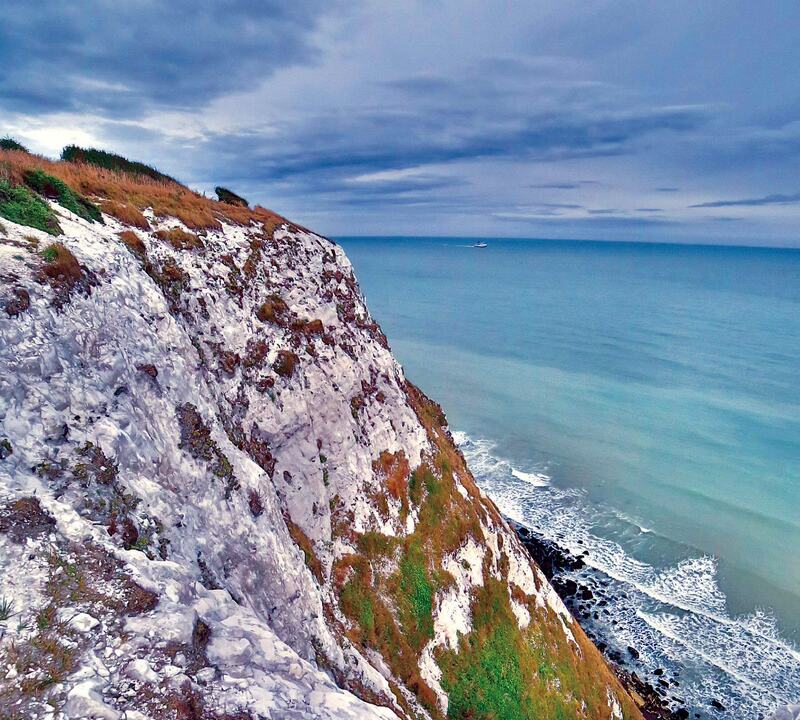 The chalk giving the famous cliffs their white appearance was formed from the exoskeletons of plated marine microbes called coccolithophores. All images from Life at the Edge of Sight: A Photographic Exploration of the Microbial World, by Scott Chimileski and Roberto Kolter. Copyright ©2017 by the President and Fellows of Harvard College. Used by permission. All rights reserved. The plated marine microbes called coccolithophores (above, Emiliania huxleyi) shed their disc-shaped armor over millions of years, allowing it to accumulate at the bottom of the ocean. 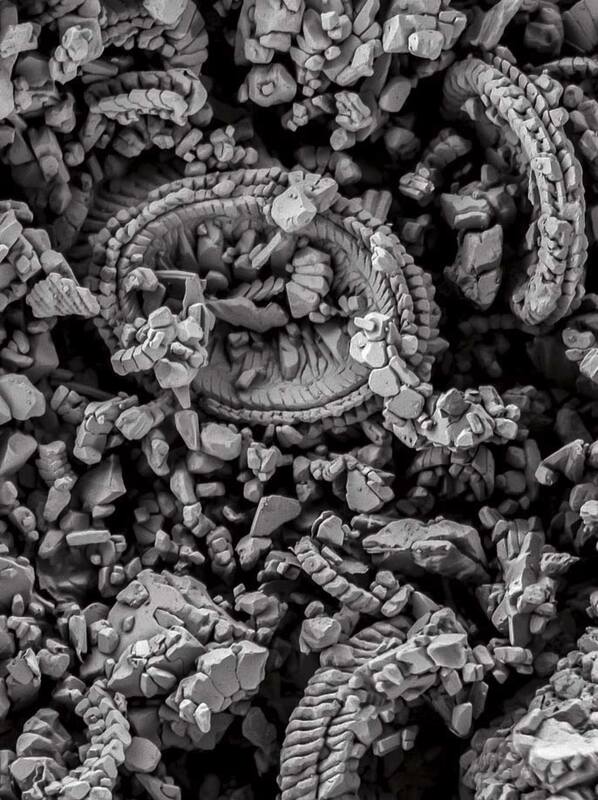 With the aid of a scanning electron microscope, the round coccolith structures can be seen in a sample of natural chalk from the Cretaceous period. 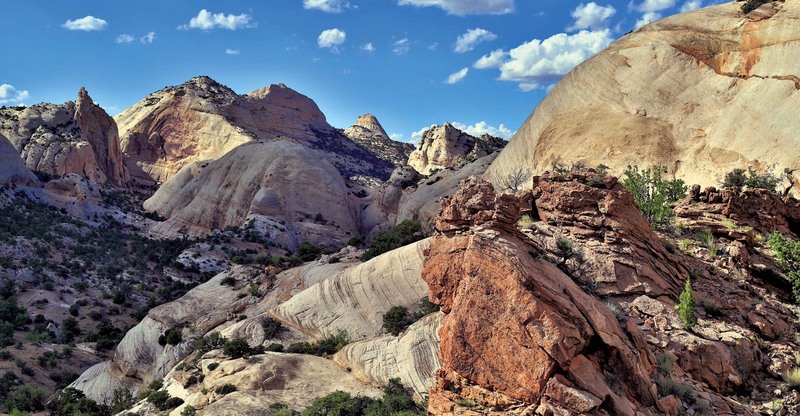 An outcrop of 200-million-year-old fossilized stromatolites (foreground, above), at Capitol Reef National Park, Utah, formed by microbial mats that grew undisturbed for millennia before there were any animals to eat them. 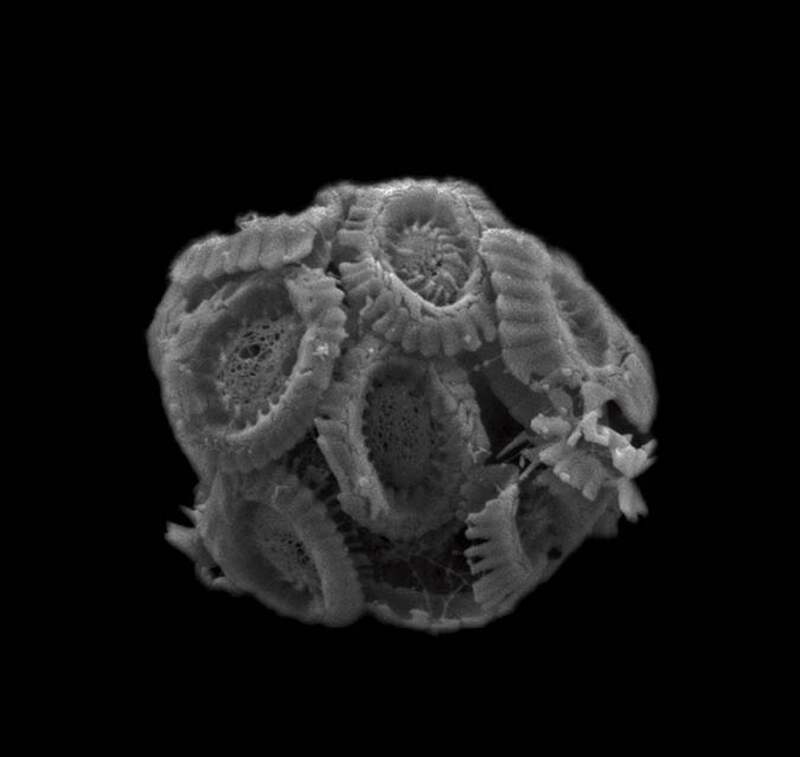 As far back as three billion years ago, the ancestors of modern photosynthesizing cyanobacteria produced oxygen that led to the formation of the earth’s protective ozone layer and the rise of life as we know it. 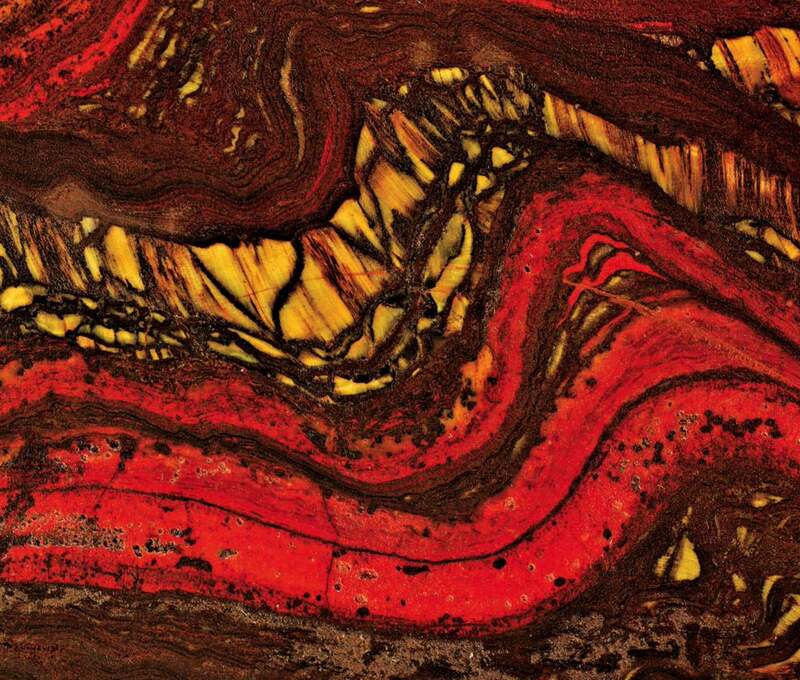 They left behind traces like this 2.4-billion-year-old banded iron formation from the Pilbara region of western Australia, formed in layers of sediment at the bottom of oceans as the oxygen from these ancient cyanobacteria reacted with dissolved iron. 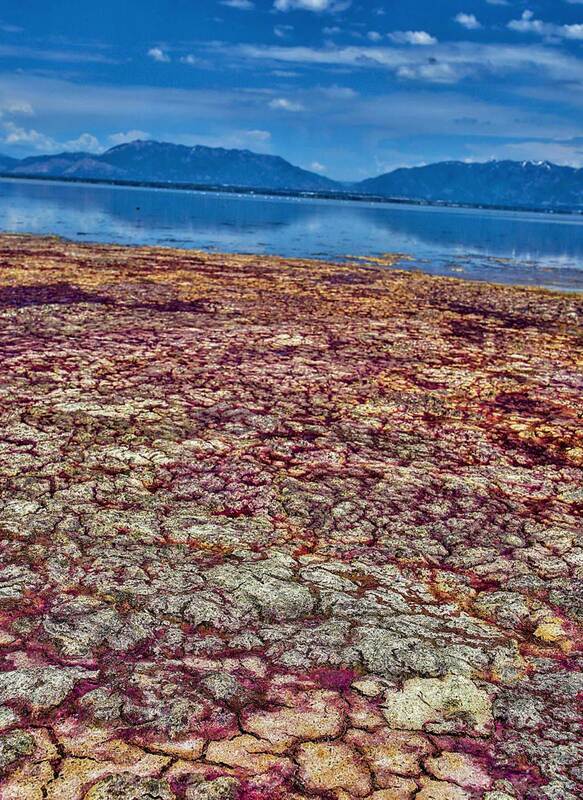 A biofilm of red, salt-loving halophilic microbes at the edge of Great Salt Lake in Utah gives a glimpse of the way microbes formed mats before the rise of multicellular organisms. Over thousands of years, minerals precipitating due to microbial activity formed reef-like structures. Today, these mats thrive where other forms of life cannot. 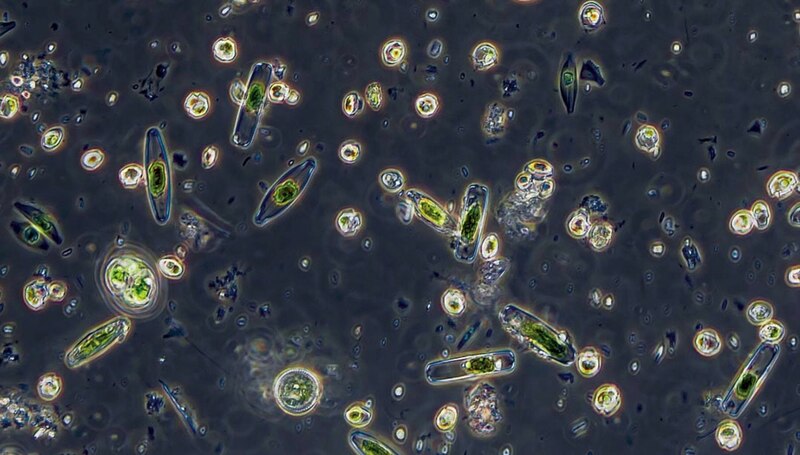 Raising the magnification on a sample of the halophilic microbes diluted in saline solution reveals glassy green diatoms, their cell walls made of silicon dioxide. Electron microscopy provides an even closer look at these diatoms shown above: the large, photosynthetic eukaryotes (above), embedded in a mud biofilm. In rocks and soil, air, ponds and oceans, life is dominated by creatures that humans cannot see. 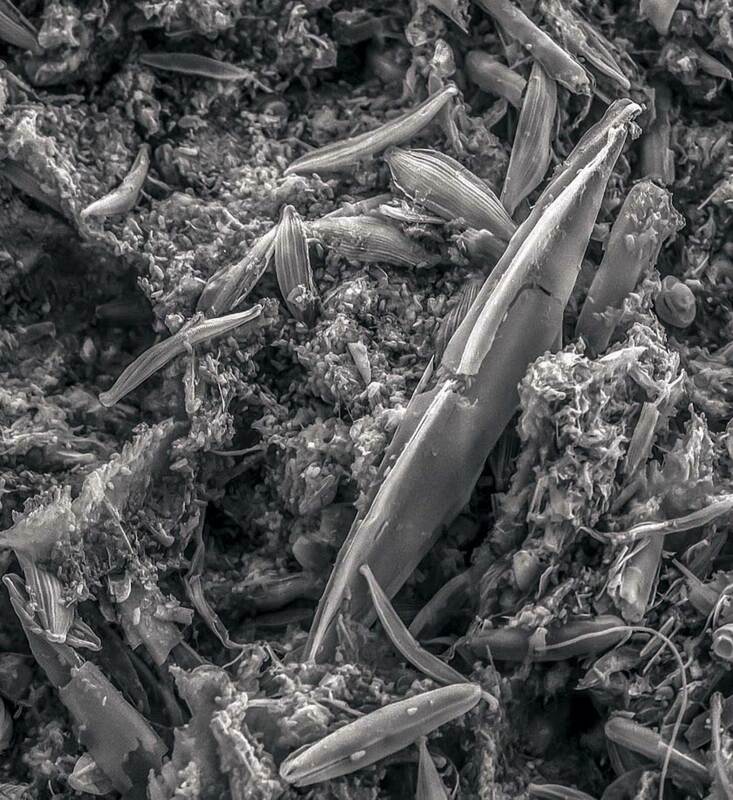 Microbes thrive everywhere, from gardens and kitchens to the harshest environments on the planet: under polar ice, in hydrothermal vents at the bottom of the sea, in hot springs that spew acid. A single gram of soil teems with billions of them, and their genetic diversity is equally impressive, dwarfing that of all the plants and animals on Earth. Life at the Edge of Sight: A Photographic Exploration of the Microbial World (forthcoming from The Belknap Press of Harvard University Press), brings the planet-shaping diversity of these single-celled, microscopic organisms into view through stunning images. Co-authors Roberto Kolter, professor of microbiology and immunology, and Scott Chimileski, a research fellow in microbiology and immunology at Harvard Medical School, share their passion for the subject in part by magnifying what cannot be seen unaided, in part by revealing large-scale microbial impacts on the landscape. Kolter has long been a leader in microbial science at Harvard, while Chimileski brings to his scholarship a talent for landscape, macro, and technical photography (for more photographs, explore the galleries above and below). Even the eukaryotic cells (left) that make up mammalian tissue show traces of their origins as free-living cells. The energy-producing mitochondria (green) in these mouse cells are derived from bacteria captured in the distant past. Fluorescence confocal microscopy also reveals each cell’s nucleus (blue) and cytoskeleton (red). Although the many-headed slime mold Physarum polycephalum (above) moves and pulses like a multicellular organism, it is, in fact, one cell with a single, continuous cytoplasm. Images from Life at the Edge of Sight: A Photographic Exploration of the Microbial World by Scott Chimileski and Roberto Kolter. Copyright © 2017 by the President and Fellows of Harvard College. Used by permission. All rights reserved. Chefs know them as button mushrooms, but they are the fruiting bodies of a fungus called Agaricus bisporus. From spores, the fungus forms filamentous hyphae that grow into thicker-branched networks of mycelia inside a log or other medium. Mycelia form buds that grow to become mushrooms. Though the species is typically brown-capped, during the 1920s a grower in Pennsylvania selected a white variant for cultivation, thinking it would be more marketable. That strain is now the main commercial variety worldwide. The so-called hedgehog microbial ecosystem of human dental plaque (below right), as seen using fluorescence microscopy. The colors of this microbiome represent different bacterial groups, including Streptococci (green), Corynebacterium (pink), Leptotrichia (light blue), Capnocytophaga (red), Porphyromonas (blue), Neisseriaceae (purple), and Haemophilus (orange). Micrograph by Jessica Mark Welch of the Marine Biological Lab of Woods Hole, Massachusetts, in collaboration with Gary Borisy and Floyd Dewhirst of the Forsyth Institute. Aspergillus oryzae is a filamentous mold, shown here growing on rice kernels. In Japan, it has been used for thousands of years to produce sake, miso, and soy sauce. The blue mold Penicillium roqueforti, which forms fuzzy green colonies in cavities within cheese, has been domesticated for more than a thousand years. Cheesemakers use it to impart particular aromas, textures, or colors to their products. In crafting a human-scale narrative, the authors remind readers that the local ecology of microbes is closely tied to health: most germs protect people by keeping harmful microbes in check, boost access to nutrients in food, and only rarely cause disease—not surprising, because genus Homo evolved in a microbial world. Humans have even domesticated some microbes, albeit unwittingly for most of history: in the fermentation of wine, or the culturing of cheese. From these familiar examples, the authors pivot to specimens so bizarre that they seem almost extraterrestrial: single-celled intelligent slime molds (cabbage-sized, or larger) that can crawl along a decaying log at five centimeters an hour, or a “humongous fungus,” covering 10 square kilometers in Oregon, that lives in the soil and reaches up into trees, fruiting from under the bark as mushrooms each autumn. The mutability and generative force of microbes are so great, in fact, that Kolter and Chimileski assert that if life exists in distant galaxies, microbes are almost certainly involved. Kolter and Chimileski created their book together to help others appreciate “the beauty that is inherent in visualizing the life of microbes.” To accomplish that, they deployed a range of technologies, from simple handheld cameras to high-energy fluorescence imaging that can capture three dimensions, to electron microscopy’s 10-million-times-magnifications. Above all, they aspire to make the microbial world accessible. In an epilogue, they note that with a Foldscope—a magnifying device made from nothing but a sheet of paper and a lens—anyone can take in the microbial world, perhaps over a bottle of wine and a wedge of cheese.